The French for pity is the regular ER verb apitoyer. 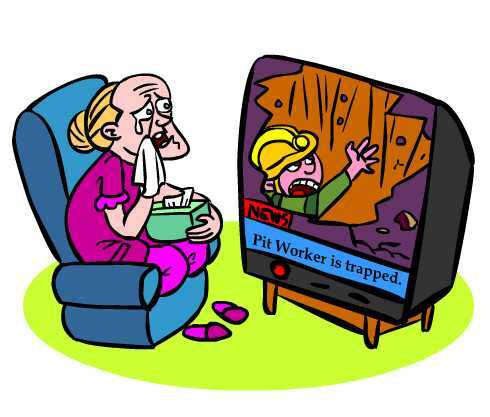 To remember this, imagine you pity A PIT WORKER trapped in a mining pit! Apitoyer can also mean: to feel for, to move to pity. - l'apitoiement (sur) (nm) : pity (for). - l'apitoiement sur soi-meme (nm) : pity for oneself, self-pity. Note the English verb pity does the same - (pities, pitied). Examples of this family of verb conjugations: aboyer, apitoyer, dénoyer, flamboyer, noyer, ondoyer, soudoyer, tutoyer. No need for pity when you learn French with innovative techniques like Cartoon Memory Triggers. To remember a word, just think of the pic! trapped in a mining pit! pity! apitoie ! apitoyons ! apitoyez ! ✔ apitoyer is a regular ER verb. There are over 5,000 ER verbs these being the most common verbs in French. ✔ Learn apitoyer and it will reinforce the pattern for ALL those other ER verbs. ✔ You can more easily remember words and verbs like the French verb apitoyer - French for pity - using the techniques of the world's Memory Masters. 200 Words a Day! Free Daily French Lesson Online - the verb in French for pity is apitoyer - fully conjugated. French Learning Made Fun and Fast with your free Daily French Verb Lesson - apitoyer.